In this Avada Theme Tutorial, I will be sharing video lessons on how to install the Avada theme, how to customize the Avada theme settings, and how to design a web page from scratch. You’ll learn how to use the Fusion Page Builder plugin that comes with the Avada theme and is required to install when you purchase the Avada theme. Before getting started, make sure you’ve purchased Avada from Themeforest and you can use this link here to do so if you haven’t. It’s an affiliate link so it helps me earn credits to my Themeforest account if you decide to use the link to purchase your Avada theme. Thanks for the support. One of your first steps to designing a new WordPress website is choosing your theme. For all of my websites that I build, I like to use the Avada WordPress Theme from Themeforest. 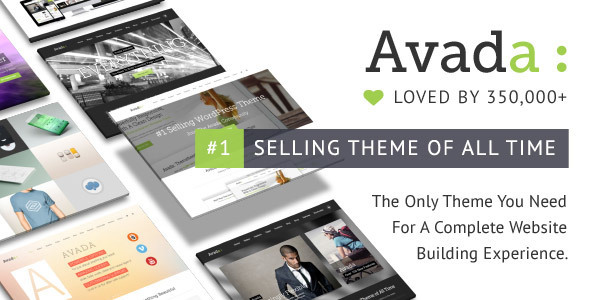 Themeforest has a great selection of WordPress themes, both free and paid, but the number one downloaded Themeforest WordPress theme is Avada. The first step in this Avada theme tutorial is the installation. You’ll need to visit the downloads page under your My Account settings in the Themeforest menu bar. Then click the Install WordPress File Only option and it will download a zip folder to your computer with all of the themes files compressed together in one easy to upload folder. Next you’ll need to head into your WordPress website dashboard and find the Appearance tab. Click themes, then click add new, upload, and select the Avada WordPress Theme zip file from your computer. It will begin installing and when it finishes, click “Activate” to set Avada as your current active WordPress theme. Watch the YouTube Avada Installation tutorial I’ve recorded for you. Once you’ve installed the Avada theme, you’ll be required to register it by snagging a token code from third party website Envato and pasting it into the box under the Register tab of the Avada theme settings. It’s easy, don’t worry. It takes 30 seconds to register your new theme. Just follow the directions on that page. After registering your theme, you’ll need to download the two required plugins; (1) Fusion Core and (2) Fusion Builder. They also list out additional plugins that are recommended to use with the Avada theme but aren’t required to download. Now you’re also set to begin customizing your WordPress website using the Avada theme settings. You can also import demo theme templates that Avada has pre-built for you. If you decide to import a demo theme, you have the choice of importing all pages, posts, images, settings, etc. or picking and choosing certain things you want to import and not import. Get started watching part 2 of this Avada Tutorial series. After you’ve completed the install, registered the theme, and installed any plugins or demo template settings you desire, the next step is to play around with the Fusion Builder plugin. You’ll quickly learn how to build custom WordPress pages from scratch using the containers, columns, and elements that make up a web page. Check out this 30 minute Avada tutorial where I walk you through the page builder plugin if you want to challenge yourself and build your own custom pages or make changes to existing templates you’ve installed. Overall, my review of the Avada WordPress theme is all positives. I believe it’s a beginner friendly theme thanks to the demo templates you can install to quickly copy beautiful professional designed websites Avada has built for you. The Avada Theme creators have added so many features to this theme that it should cover any needs you may have for your website design aspirations. The cost is very affordable. You pay a one time fee of $60 and can use the theme over and over again for multiple websites. If you’re still on the fence about whether or not the Avada WordPress theme will be the right theme for you, check out their demo and play around with it via the link below. It’s free to demo it first before deciding to purchase. Have You Seen My Courses Students Love? P.S. If you’re not on my email list and part of my email community, sign up below! I’ll send you weekly tips and lessons to help you build your blog and online business! Start and launch your blog in just 7 days following the videos and steps in my FREE email course. Plus get access to bonus resources. Get started today!